what is awk ? The basic function of awk is to search files for lines (or other units of text) that contain a pattern. When a line matches, awk performs a specific action on that line. 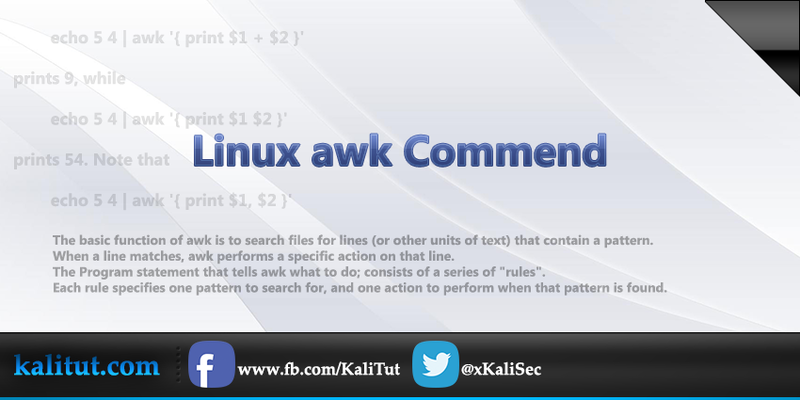 what is awk Command ? The Program statement that tells awk what to do; consists of a series of "rules". Each rule specifies one pattern to search for, and one action to perform when that pattern is found. 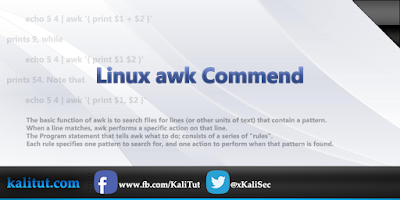 How to Use Awk to Find and Sort Text in Linux ? This means "on every line, print the second field". since the password file has fields delimited by colons and the home directory is the 6th field. which will convert fahrenheit temperatures provided on standard input to celsius until it gets an end-of-file. awk has some built-in variables that are automatically set; $1 and so on are examples of these. The other builtin variables that are useful for beginners are generally NF, which holds the number of fields in the current input line ($NF gives the last field), and $0, which holds the entire current input line. You can make your own variables, with whatever names you like (except for reserved words in the awk language) just by using them. You do not have to declare variables. Variables that haven't been explicitly set to anything have the value "" as strings and 0 as numbers. Note the use of $i to retrieve the i'th variable, and the for loop, which works like in C. The reason tot is explicitly initialized at the beginning is that this code is run for every input line, and when starting work on the second line, tot will have the total value from the first line. If you put no expression, the block is run on every line of input. If multiple blocks have conditions that are true, they are all run. There is no particularly clean way I know of to get it to run exactly one of a bunch of possible blocks of code. The block conditions BEGIN and END are special and are run before processing any input, and after processing all input, respectively. As hinted at above, awk supports loop and conditional statements like in C, that is, for, while, do/while, if, and if/else. Note the use of NF to iterate over all the fields and the use of printf to place newlines explicitly. of from the first command line argument. compatibility with the Bell Labs research version of Unix awk. Use compatibility mode, in which `gawk' extensions are turned off. Give warnings about dubious or non-portable awk constructs. Version 7 Unix version of awk. turned off and additional restrictions apply. Allow interval expressions, in regexps. is mainly for consistency with POSIX argument parsing conventions. "standard input", (piped output of some other command or the terminal.